How often do we think of the Sacred Heart of Jesus? I don’t know about you, but I love to read a good book, especially a true story. One of the best biographies of Saint Margaret Mary Alacoque’s life, recommended by historians and religious alike, is the work written by Bishop Emile Bougaud. Translated to English from the French and originally published in 1890, this book gives the reader wonderful insights into St. Margaret Mary’s life and how Sacred Heart spirituality developed after her death. Although it is written in a style that may not readily reflect our post-modern mentalities, yet because Bougaud used so many archival sources and letters penned by our saint, the book has a ring of real authenticity. If you can get past the expressions of an earlier age, there is a wealth of information within its covers. 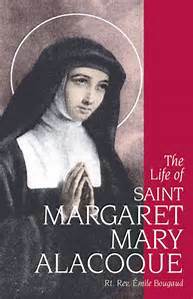 And you can discover from its reading, I believe, what was really going on around St. Margaret Mary and all she went through to promulgate the messages she received from the Sacred Heart of Jesus. For me, the abundance of information from first-hand sources contained in one book, makes this resource a very valuable tool in learning about St. Margaret Mary and devotion to Christ’s Heart. My novice directress, a woman of deep spiritual discernment, regarded it as the best life of our saintly Sister. So far, I had found no way of fostering devotion to the Sacred Heart, which was all I lived for. Here’s how God gave me my first chance… While I happened to be in charge of the novitiate, the feast of St. Margaret fell on a Friday. I asked the novices if instead of paying me the little compliments they’d planned for my feast day, they would pay them to the Sacred Heart of our Lord Jesus Christ. They did their best to humor me, and made a tiny altar; above it they put a piece of paper on which was sketched a little pen-and-ink portrait of the Sacred Heart. In front of this shrine we tried to give our Lord such homage as He inspired us to make. The result was that I incurred a good deal of humiliation, opposition and mortification — and the novices too! I was accused of wanting to introduce a new devotion. For myself, these sufferings were a great comfort; the only thing I dreaded was that the divine Heart would be brought into disrepute — the comments I heard around me struck like swords at my breast. I was forbidden to display any more pictures of the Sacred Heart; a few private devotions—that was the most they would allow. One can sense that our saint was having a very rough time of it. In fact, by the evening of her feast day, the superior, seeing the division in the community over Margaret Mary’s actions, had already gone to her, forbidding her to do anything further that would attract the attention of the community to this new fangled devotion. Whatever small victories she had won in the novitiate to promote devotion to Christ’s Heart, were totally squelched from even reaching the rest of the Sisters. Of course St. Margaret Mary obeyed, but she poured out her complaints to the Lord. Afterwards, she tells us that she heard an interior voice say to her,“Fear nothing, my daughter. I shall reign in spite of my enemies and those that wish to oppose me.” Certainly her mild-mannered superior at that time never realized that she was thwarting the will of God. Yet, Mother Melin’s restrictions only served to give greater proof to the fact that the finger of God was at work here, and it would triumph over all obstacles. These are powerful sentiments welling up within our saintly sister. Here is a person totally consumed by the love of the Lord who wants to make known His great affection for every person He has created. Jesus had specifically asked Margaret Mary to let everyone know of His burning love for them. But now she cannot say even one word in her community to promote these messages from the Sacred Heart of Jesus. She is caught between a rock and a hard place. Feel her frustration. Feel her helplessness. Feel her disappointment. What is she to do? For one thing, she is not limited in writing about the Sacred Heart to confidants outside of her community. Two of her former superiors — Mother de Saumaise and Mother Greyfié — who are well aware of her apparitions and her religious fervor could perhaps be inspired to help. Since they are now at the head of other Visitation houses, she could urge them to respond to Christ’s appeal to make the Sacred Heart of Jesus known and loved. Fortunately, both of them became vital instruments in propagating Sacred Heart devotion in their own communities and soon others become aware of Christ’s messages of love. But there is one thing that is haunting our holy sister, that she feels she must do. Bougaud points out: “The first thing that St. Margaret Mary desired was a picture that would attract the gaze and prepare the heart.” So St. Margaret Mary now turns impresario. With all the ardor of her soul she urges Mother de Saumaise and Mother Greyfié to procure a copper-plate that was capable of mass-producing images of the Sacred Heart of Jesus to distribute among the faithful. This project of scattering images of the Sacred Heart of Jesus far and wide became a pressing desire of our saint. Interiorly, she realized that a worthy image of the Sacred Heart was so important for inflaming the mind and heart to prayer and to contemplation of Christ’s tremendous love. This thought was truly inspired from above. We know that the teaching of the Church (see for example, Catechism— 1162) tells us that “the beauty of images moves us to contemplation.” And what is contemplation? It is a gaze of faith, fixed on Jesus where I look at Him and He looks at me. In that exchange we begin to gain insight into heavenly mysteries as we come to know the Lord better. To know Him is to love Him and to love Him is to follow Him. Our holy ancestors in the faith knew that we are slowly being made anew and changed into Christ’s image and likeness, that we are being purified each time we gaze upon the Lord, even though it appears to be just an image or an icon. That is why religious houses are filled with holy artwork that constantly reminds us of Christ’s presence and keeps before our minds holy thoughts. To make the Sacred Heart of Jesus known and loved among the populace, St. Margaret Mary was inspired with the idea that a picture was absolutely necessary to engage the sentiments and devotion of the faithful. Remember that the Lord had specifically told her that He would bless any place and family where an image of His Sacred Heart was exposed and honored. Now centuries later, we have to ask ourselves if all these efforts of St. Margaret Mary have met with a response from ourselves. Because I like to think that we as devotees of the Sacred Heart of Jesus have within our homes and places of work sacred images of Jesus that remind us of His loving presence and elicit from our hearts that return of love He so ardently desired. You experience daily that this world of today is always trying to visually tempt us into the realm of impurity, materialism, avariciousness and many other vices. Young people are constantly bombarded with enticements of this kind so they can be one of the crowd and fit in with their peers. Older folk are allured by the so-called “good things in life,” and without even considering the cost to their eternal souls, immerse themselves in the pleasures of life, so often reflected in their earthly abodes, many of which are thoroughly secularized. Who wants to be reminded of Christ’s sacrificial love when we are over our heads in concerns for money, prestige, getting ahead in life or just enjoying our retirements and the securities of friends, family and savings? So I truly believe that this inspiration to surround ourselves with visual images of the Sacred Heart is something important for keeping us focused on why we are here and where we are going. Humans need reminders. Our investment in placing in our homes images of the Sacred Heart says to the Lord that we value His presence in our dwellings and in our lives. This talk on Sacred Heart Spirituality was given on August 7th, 2016 by one of the Sisters of the Visitation of Holy Mary at the Visitation Monastery in Tyringham, Massachusetts. The next talk will be held on Sunday, October 2nd, 2016 at 4:00 pm. All are invited to attend.